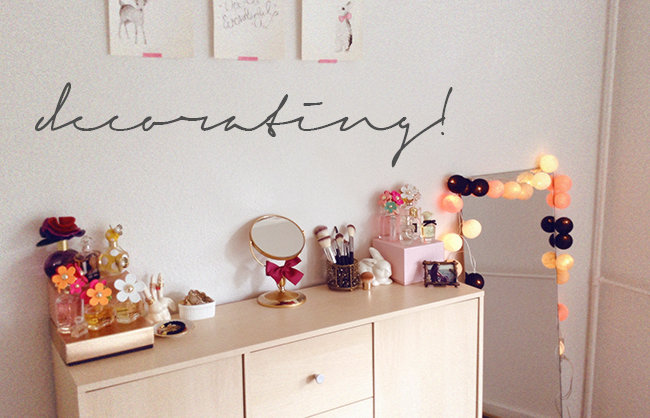 The time has come for a new decor post! I have done one in the past (here) but now this little corner looks quite different. Yesterday I received these beautiful fairy lights from cable & cotton. I picked out the colors myself - these are Ivory, Oatmeal, Salmon Pink and Pure Black. I love how the colors look together and I think I found the perfect place for it on the mirror. The best thing about these lights is that they look pretty either lit or not and make the atmosphere cozy in an instant. Wouldn't you like to get a set as well? Let me know which colors you would choose! Love your decoration. The lights are beautiful! I love these little lights! They always make a room complete. I love this room...I like everything...the lights are beautiful! You have such a beautiful room and the decoration is so pretty and sweet. Thank you for following. I'm following you too! I can see that you're also addicted to the fragrance of Marc Jacob's Daisy!! And this article is just pefect again! Your pictures are stunning. Do you know dat? All the gold makes everything so elegant and I love those lights! I always wanted fairy lights but I think they're ugly when off. Problem solved! The lights make everything look so pretty...what a lovely color scheme! Super jealous! This looks awesome! I wish I had some type of title makeup station! This is such a lovely room ! Nice decor ! Lovely, simple and classy too! I love the decorations you chose. I want to have those pieces in my bedroom as well. That's so gorgeous. The prettiest photos ever, I want everything here! i've been looking at your blog for these two months, and I am really inspired by your blog :') you've got a very beautiful layout and photos, and I really love how you decor my room! <3 thankyou for being a such great inspo! Your room is very wonderfull dear!!! 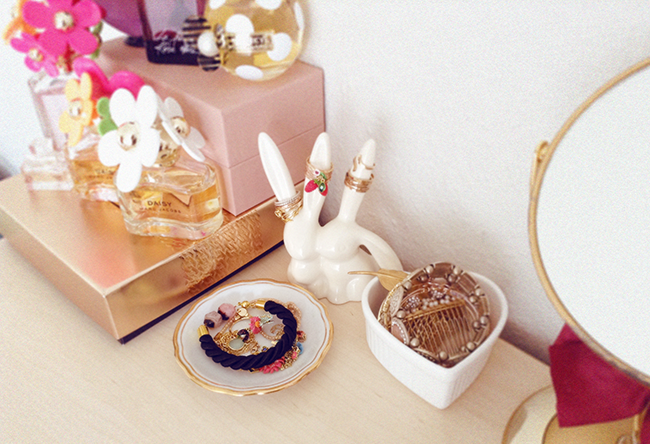 I love your accessoires! Thank you for visiting my blog! Do you want to see my last post? Beautiful inspirations! I love decorating, I was wishing all! Have a blessed day kisses. You have a lovely set up! Beautiful! I love the cosy atmosphere such a small detail adds to the room! how beautiful is this little corner!? i love the lights! so perfect for creating a cozy space. Thanks for following! I love the Cable & Cotton lights...really want some for my room! its so simple but so cute at the same time. I am in love! And I am in love with you're blog. It's the definition of perfection. 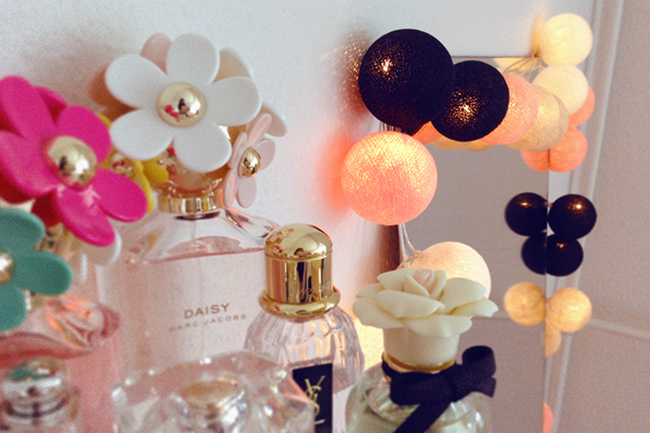 I love all of your pretty perfume bottles! 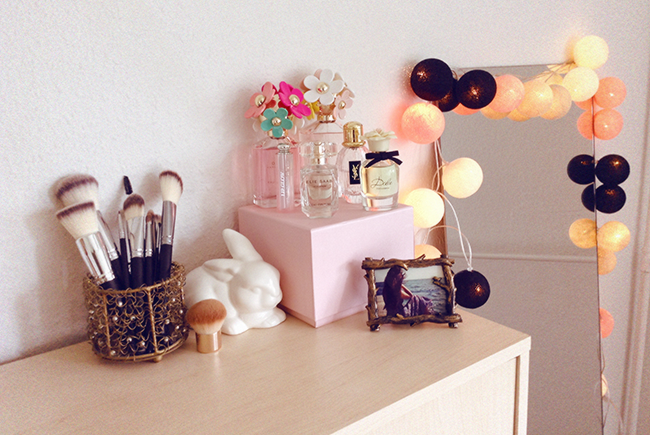 Your setup is so lovely and the lights create the coziest atmosphere ever! Love it!